Wall lights are available in a huge range of shapes and sizes, and are available at all DIY stores. Prices start from £10, and this additional lighting can be fitted on any wall. Add a dimmer switch to control them and you can match your room lighting to the mood you want – bright and cheerful or warm and calming. Ceiling lights are available in a range of different styles, and can be fitted anywhere in the room – not just where your light is now. Many people now opt for low-voltage downlighters, and they can certainly look very effective. Fan lights are perfect on a hot day, and they are available in a wide range of colours to suit your décor. In winter it’s possible to reverse the flow so that the fan pulls cool up through your wall mounted radiators – which forces the warm air downward. Kitchen lights are a very easy way to enhance the appearance of your kitchen. Fit additional lighting under cupboards to illuminate your work surfaces, or on the tops of cupboards to reflect off the ceiling. 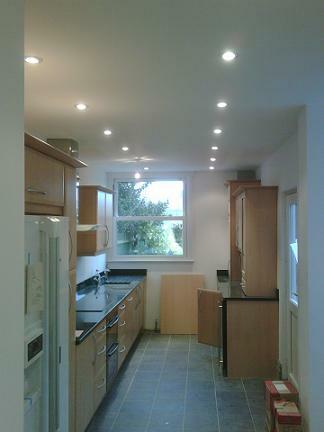 Or how about directional downlights in the ceiling, pointing down at your worktops?